Can a high school student become the symbol of a national youth movement? Well, that’s the case of Anuna de Wever, one of the leaders of the protests against climate change in Belgium. For the 9th week in a row, she took to the streets with thousands of other people. "We need to keep striking- she says- we need to keep going and we need to keep showing them that we can take responsibility to take care of our future and that they should maybe do the same". Anuna is 17 years old and attends her last year of high school. What drives her is fear, she explains. "In Belgium, we had a lot of heat waves this summer and I am aware of the what the effects will be if we just keep going on this rate”. She was received by many politicians, included the French president Emmanuel Macron. But all the decision makers that she met gave her a bad impression. "They act like children, they don't see that the emergency is now and they think that if they close their eyes the crisis disappears". Her family supports her activism, despite the fact that she is collecting quite a few absences at school. It is a price to pay for having an impact on a bigger scale, she hopes. "The government has a gigantic role in climate change and if they keep putting money in the big industries it doesn’t matter if we all take short showers or eat less meat because they need to do their part and it is the biggest part". Together with her friend Kyra, she leads a nationwide movement that sees a lot of women engaged in fighting against climate change. “I love to see that a lot of women are now coming up for this movement, I think that now women are taking action and engaging in taking leadership roles”. 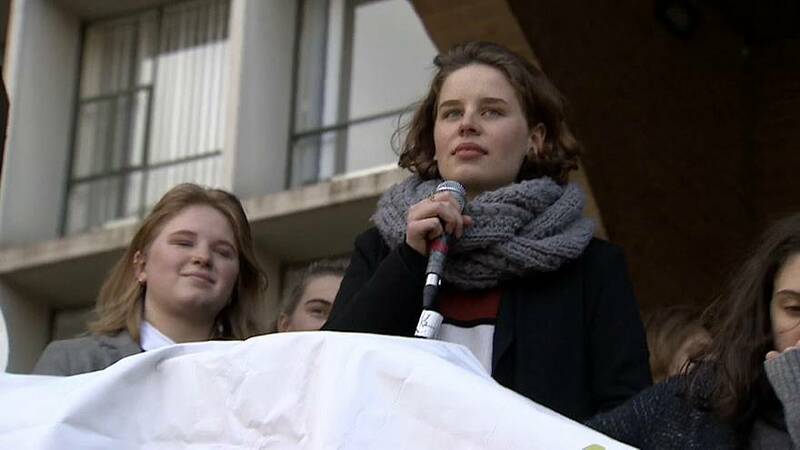 She won’t be able to vote for the next European elections, but she is determined to wake up politicians about the climate crisis. "My birthday is three weeks after the elections so I cannot vote but I think I left my voice here. I have already written a book: it is a letter to our generation, the generation of our parents and the politicians”.